Do you know that the Internet is divided into three parts? They are Surface Web, Deep Web and Dark Web. 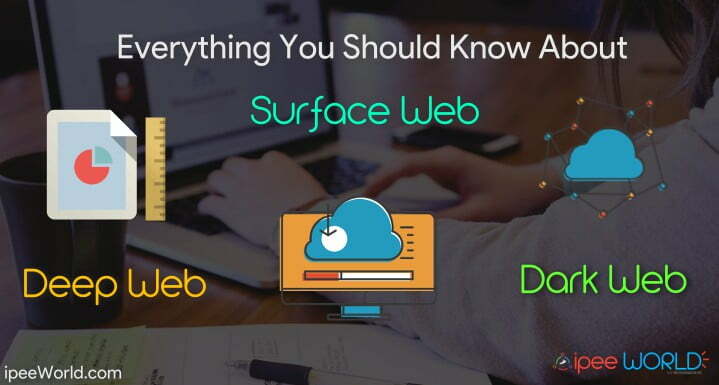 We, normal Internet users use the Surface Web to surf around the Internet.Surface Web is the part we are able to access any website directly using a simple Web Browser.Websites like Google, Facebook, Twitter and even IPEE World is on the Surface Web. Other than Surface Web, there are two different parts, they are Deep and Dark Web. We daily use the Internet for various purposes, origin don’t we? But, Have you ever though where is the origin of Internet, How the Internet formed and who found it?. You should actually research for it and read articles related to it. I’m a Tech enthusiast, and I want to find deep about Internet.Recently, I came to know about the three layers of Internet namely, Surface, Deep and Dark Web.I read a lot of Articles about it and found it very interesting. 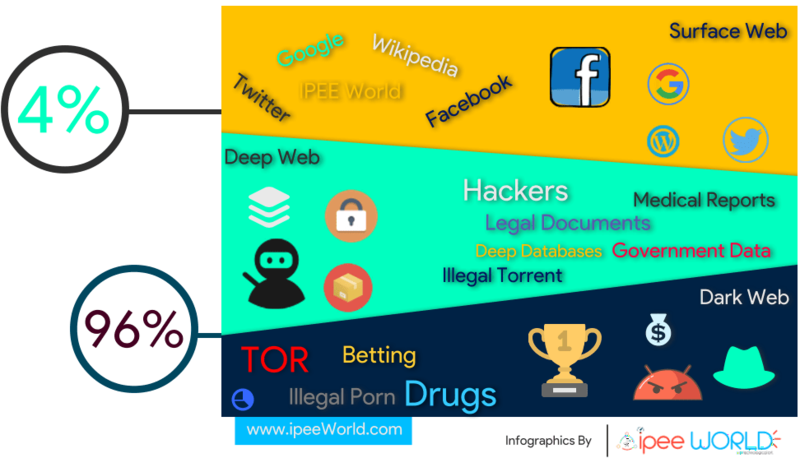 Now in this Article, I will share all you need to know about the Surface, Deep and Dark Web of the Internet. I have created a short Infographics that will help you to get a clear ides about the three different layers of the Internet. Surface Web is the layer that you are now using. You visited my Blog and it is on the Surface Web. As a normal user, you visit hundreds of Websites daily and all of them are on the Surface Web. Popular sites like Google, Facebook, Bing, Wikipedia, etc all are on the Surface Web.They are directly accessible by anyone with a simple Web Browser like Google Chrome. You daily search for number of things on various Search Engines like Google and Bing.All the search results you see are of the Surface Wb.As said, Results from Deep and Dark web will not be displayed by Search Engine. Search Engine Bots can only crawl and index webpages from the Surface Web. The Surface Web is just 4% of the whole Internet, What 4%? Yeah, You heard it right. As per the estimation the Surface Web is said to be occupying 4% of the total Internet and remaining 96% are hidden in the Deep world. Deep Web is the second layer of the Internet which are not indexed by Google or any other Search Engine.Just because they are not crawled by Google, You cannot find any of them on any Google Search results. You save and store various files on some Cloud Storage platfroms like Google Drive. You can save any of your important or personal files here. Any files you store here will not be indexed by any Search Engine and no one can find it.These datas are not shared with anyone. Everyone uses various Cloud Storage service to store their personal or important documents.This may be Family Photos, Videos or any other files. They all are private and no one other than the Administrator can access them.Their links are not shared and is not accessbile to any third-parties. 96% of the Internet is in form of Deep and Dark web, it’s to vast and most of the people don’t know about it. Database details of Police, FBI, etc are stored in the deep web. Now the last and third layer of the Internet: Dark Web. Dark Web is not something that you think; it’s very dangeruos.Everything that happens at the Dark Web is completely Illegal and is agianst Cyber Laws. In the Dark Web, the main thing going on is some kind of illegal bussiness.Trading for Guns, Ammo’s and much more illegal stuffs are going on here.Visiting these sites are completely illegal and you should never do it. As I told you earlier, everything going on in the Dark Web is illegal and you will be jailed if you visit any of those sites and participate in any malpractice or trade. Same as Deep Web, Dark Web is also not indexed by any Search Engine including Google and Bing.You need particular link to visit those sites. We cannot access any Dark Web websites with normal Web Browsers.We need special Web Browsers for visiting these site. There is an open-source Web Browser called TOR Browser. It’s extended version is “The Onion Router” or simply “TOR”. This is the only Web Browser through which you can access the Dark Web. I won’t share any details regarding how to access Dark Web Websites and you should also never do it.It is completely illegal to visit any of such site. Even I have not visited any Dark Web sites, and I reccomend the same to you.NEVER VISIT ANY DARK WEB WEBSITE. That’s everything you should know about the three important layers of the Internet.You can read more about the three layers of Internet at wikipedia as well(Links are mentioned above). Share this article on Facebook, Twitter and G+ and let your freinds know about the hidden secrets of the Internet.